Generally plants raised after the 1950-60's were not bred for hardiness, whereas the old border plants, which have survived, do not need to be lifted and dependably provide a feast of colour every autumn. A quote from John Woolman (1992) who in his lifetime was President of the National Chrysanthemum Society and holder of the RHS Victoria Medal of Honour and Veitch Gold Memorial Medal. "These plants can be grown with the minimum of effort and without the worry of winter storage"
Hardy Chrysanthemums can be mixed in a general herbaceous border using the available heights of individual cultivars to mingle with other plants. For maximum effect plant in-groups of three or five of one colour. The heights of these chrysanthemums can vary from 45cm to over 1.5m, with all forms of flower types represented from singles, semi-doubles, doubles and pompons. Also the petal (ray floret) shape can vary in a very pleasing way from flat, spoon, quilled or boat shape, with the visible central discs (disc florets) being mainly yellow or occasionally green. Many are scented providing a nectar feast late in the season for hoverflies, bees and butterflies. For spring interest mix these chrysanthemums with plants which appreciate shade later on in the season such as hellebores, primroses, Dicentra, Corydalis, and Viola. Alternatively, the spring bulbs such as tulips, crocus and daffodils, which die down after flowering, provide good partners. Summer interest plants which can look untidy, such as Papaver oriental cultivars and alliums associate well with the green growing chrysanthemum plants providing cover. Alternatively they can be mixed in the autumn border with asters, Eupatorium, sedums, Japanese anemones, and grasses. This autumn bounty will give plenty of interesting material to cut for the house with the chrysanthemums lasting as long in a vase as any florist flower. True these flowers are not as highly bred as the florist ones but they have a grace and elegance all of there own. Hardy chrysanthemums are as easy to grow as the majority of border perennials. These will do well in a sunny border where the soil has been well prepared. A general fertiliser such as blood, fish, and bone or Growmore worked into the soil each spring at a handful per square metre plus a good mulch of compost applied around the plants, will give them a good start to the season. Every two to three years, to prevent over crowding, split in May or thin out the weakest shoots in June or July. Retain the strongest individual offsets with the most roots and replant them at least 40cm apart into soil prepared as above. Firm and water them in well. If an increase of stock is needed, conventional cuttings an also be taken at this point, using cut material some 6cm long inserted into gritty open compost and kept in a protected cold frame until rooted (approximately three weeks). The plants can be pinched in late May or not depending on the effect wanted, stocky plants or plants which may weave around other types of flowers or foliage. Overcrowding leads to more trouble than any other cause. Care must be taken to ensure there is no check during the rapid growth in late summer. Check again for overcrowding thin out again if necessary and water well if there has been a lack of rain. Stake plants if necessary as with any other border plant. Good husbandry at this stage will reap rewards with the subsequent autumn display. Overfed border plants do not resist frosts well and can over-winter badly, something to bear in mind if you wish for late colour in the garden. A good indication as to winter hardiness is the amount of basal growth showing when the plants are cut down in December. Destroy the dead top growth (to prevent disease) and in exposed borders lightly cover the plants with a dry mulch, cutting the stems back also prevents winter rock exposing the roots. If you wish to keep a cultivar of doubtful hardiness, especially if the plant is small, then take up, immediately after flowering and pot up in a well-drained compost and place in a cold frame or greenhouse over winter. Some plants are very cold tolerant but succumb to winter wet so do observe your local conditions. Gaps in the border can be filled with chrysanthemums from a stock bed and can be moved even in bud if sufficient root is taken and the plant is watered in well. Having a mixed border will help reduce the quantity of pests as a large stand of just one type of plant is more attractive to pests and allows quicker multiplication. Within a mixed planting there is a greater range of flowers offering nectar to beneficial insects, so a stable balance is easier to achieve. Good husbandry, especially in avoiding overcrowding, will increase the airflow through a clump and lesson the chances of rust developing. "There are 2 types of rust affecting Chrysanthemums: white and brown rusts caused by the fungi Puccinnia horiana and P.chrysanthemi respectively. White rust is the most serious disease. Infected leaves exhibit yellow to tan spots on the upper surface which correspond to dirty buff/white pustules on the undersides. This disease is rapidly spread and difficult to control as the fungus survives on plants and stools.Complete destruction of all affected plants is recommended. Spraying healthy Chrysanthemums with an approved fungicide such as Systhane may prevent infection. Spraying should cover the whole plant, especially the underside of leaves." 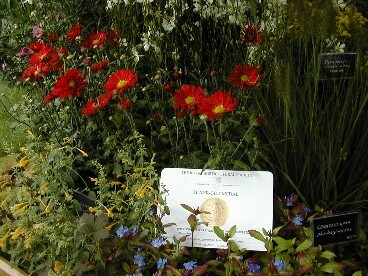 Garden Centre's have a small range of chemicals available such as Provado and Systhane, but check the packet carefully, as chrysanthemums can be sensitive to some garden insecticides. If a stem shows leaf death starting at the bottom and going progressively higher this may be eelworm damage. In early spring emerging new growth may be damaged by slugs, the use of a slug pellets, especially those less harmful to beneficial creatures, such as Ferramol is recommended.